Remember the gnawing feeling in your stomach when your high school teacher would announce, “Prepare for test day?” I certainly do ~~ and it didn’t matter how much I had studied to prepare for the inevitable day, I always seemed to break out in a cold sweat when the infamous paper would land softly onto my desk. Breathing a silent, “Ok, here goes …” I would exhale into the exam. As an adult, going through college things changed a bit ~~ the professors seldom announced the advent of a test, they simply said, “Today you will have an exam.” The same cold sweat would surface, but accompanied now with a hint of panic. This forced me to keep in step with the teachings all along the way ~~ I had zero room for getting lazy or letting my guard down. One day of laze faire would not fair well. When I came across this passage in Job, I was humbled. I seldom think of my loving God to be One Who would test someone He treasures. And isn’t that human nature, Girlfriend? We tend to view The Almighty and Powerful God as the Father Who would never be associated with “negative” things like a test. But as we read the entire three verses here, we see He has purposed His testing. 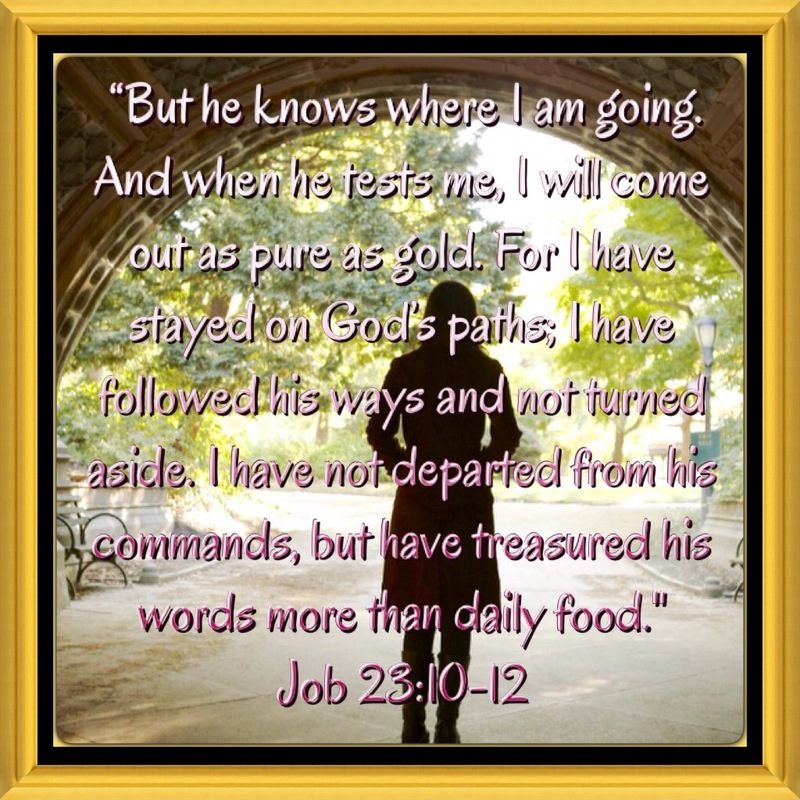 Gold ~~ He says we can come out as strong and valuable and refined and pure as gold. But in order to be victorious, Girlfriend, we have to stay the course and not depart or turn from His commands. There is no opportunity for a makeup exam. While we will definitely have countless testings and trials on this side of Paradise, each test is a unique opportunity to come through the fire as good as gold. He warns us to be on our guard and to anticipate the trials and sorrows, but He prefaces all that by calling to remembrance that we know these things are part of being here on earth ~~ and to rest in His Peace. Whatever test you are presently experiencing, Sweet Sister, I join you in prayer alongside all who may be reading this with you ~~ and I pray that you will rest in Him knowing that this momentary test is refining you so that you may continue to shine with the love of Our God and Savior Jesus Christ. Feel free to express your testings and trials here and include former times of experiences as well, so that a struggling Sister may be assured that she, too, can be victorious through Him Who Created her.